Star Heat are Gas Safe registered heating engineers who supply and install gas boilers. For similar replacement boiler companies in this area please visit the Darlington boiler page. Focused to delivering quality installations, professional & cost saving advice. We are leading the way with OpenTherm, Weather compensation and smart heating controls, saving you on fuel costs and long term repair bills. We don't just install, we design, care and we are always available. Efficiency is our mission. 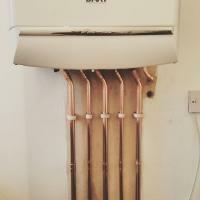 The quality in our workmanship and the understanding of heating systems, boilers and controls really help us design around your needs.